Carlos is an experienced FileMaker developer who is outgoing and energetic, enthusiastically embracing new challenges whenever they appear. Having been introduced to FileMaker at the age of ten, Carlos’s passion for its power has intensified over the years. Originally from Cuba, Carlos relocated from California to be part of the talented DB Services team. Graduating from Havana University of Technologies CUJAE with a B.S. 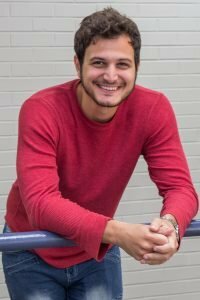 degree in Software Engineering, Carlos moved to the U.S. to pursue his ambition in the field of software development. He is highly motivated to achieve excellence in his work and to cultivate strong client relationships along the way. When Carlos isn’t spending his off hours learning new programming techniques, he likes to practice his guitar and play video games. On a sunny day, you may find him playing tennis or shooting hoops with friends.